Fume Extractors for Laser Engraving & Laser Cutting Systems - Sentry Air Systems, Inc.
You can find an extended list in this blog entry on the topic of laser fume extraction. This list is originally quoted from the Environmental Health & Safety Department website at Princeton University: http://web.princeton.edu/sites/ehs/laserguide/sec2.htm. The performance and accuracy of the laser system itself can also be compromised if particulate build-up occurs on the optics. Proper ventilation and extraction can help to prevent this. Many laser system manufacturers recommend an exhaust system with the use of their products. Epilog Laser, for instance, notes the following under ventilation system specifications for one particular line of laser engravers: “External exhaust to the outside is required. There is one output port, 4[inches] in diameter.” Some of their units are equipped with a 6″ diameter output port as well. State regulations may also affect your ventilation strategy. Depending on your location and operation, regulations may state that you cannot vent materials directly outdoors. High-Quality Filtration Media: A typical combination for laser fume control is a HEPA Filter (up to 99.97% efficient on microns 0.3 microns) for particulate containment and an Activated Carbon Filter for VOC removal. Recirculating Air Pattern: No exterior-venting required. Portable Floor Model. Aside from the addition of heavy-duty casters and a portability handle, the portable model pictured below is identical to the stationary model featured above. This model is useful for those who frequently travel or attend trade shows. 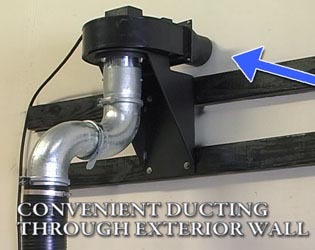 Wall-Mounted: Recirculating or Exterior Exhaust. The wall-mounted unit featured on the left side of the picture below includes a fan/filter unit that allows for a recirculating air pattern. A flame-retardant flex hose is utlized as the connection medium. Wall-mounting hardware is also included. The wall-mounted unit on the right side is an external-venting option. As opposed to the unit on the left, this model does not contain filter media. It features a fan (up to 250 CFM) and four exhaust configuration options to exhaust directly outside or into an existing ducting system. Direct-Mount. Laser systems with exhaust ports located on the top side may allow a direct-mount configuration. This option is featured in the video link below. For additional information on fume extraction solutions for your laser systems, give us a call at 1.800.799.4609, email us at sales@sentryair.com, or fill out this simple online form to receive additional information from a Sentry Air Systems Applications Specialist.